In this digitalized era, having an Online Store or an E-commerce shop is highly profitable and less expensive as compared to a physical store where you have to consider more liabilities like Physical Space, investment for the shop, furniture, and the list goes on. E-commerce has been a boon for start-ups and small stores who can’t afford to have a physical shop and still wants to start selling with a very minimal budget. You can have a handsome income and a well-set profit only by having a well-designed E-Commerce Shopping Website. If you are a newbie of this online selling realm, you will face a bunch of hurdles and challenges. The road will be having speed breakers too, but it is in your hand to make a perfect drive till the end. Do not even think of stepping back, there are many eCommerce Platforms that will serve you in the best possible manner, and through which your online store will run flawlessly on various browsers. Tighten your seatbelts, we are here to help you create and launch your own online business as per your requirements. You might have done your homework on which is the best tool for eCommerce Development and how much it will affect your pockets. Yes, or No, in both the cases we recommend you to proceed with the ensuing details of two of the most powerful E-commerce Platforms. Let's start with statistics, Shopify is powering more than 6,00,000 websites. On the other hand, WooCommerce is powering approximately 39,101,000 Websites worldwide. The data itself speaks for the popularity. Though you can check for exact numbers to know more regarding the popularity of both powerful E-Commerce Platforms. Making a decision based on numbers is not at all a good sign. Dig deep, and before choosing anyone, gain little bit knowledge about the internal facts and benefits of both powerful ECommerce Website Builder. Both of them are equally strong and feature-rich in their own ways that might possibly fit your eCommerce Web Development requirements. Still, there is a puzzle going on, in your mind, about what kind of features you need and will the platform provide the same feature or not. Above all, which one would be cost-effective and will it help you to be there in the cut-throat competition? One need to know about WordPress before jumping to the WooCommerce. Wordpress is one of the most popular and reliable CMS, which is making a tremendous number of websites more powerful with the support of its features and plugins. WooCommerce is an open source E-Commerce plugin by WordPress, which is developed to accomplish professional shopping dashboard for E-Commerce Projects. WooCommerce is all equipped with all the features that can be easily integrated into a WordPress-based Web Solution. The WooCommerce plugin is free and it supports many other plugins of the WordPress Website when it comes to functionalities. Shopify is a Canadian (HQ - Ottawa, Ontario) E-Commerce company. It is a cloud-based E-Commerce tool, which assists users/developers to develop a full-fledged shopping store. The platform is easy to use. In case once it is developed and you want to make modifications, you can do it by yourself without any hassles. Initially, you need to take the help of an expert eCommerce Web Developer. With this platform, you can start, grow and manage your online presence easily. It has everything to sell almost everything. So, if you are just about to start from a scratch, and wanted to have a simple website to explore virtual business opportunities, then Shopify is certainly a wise choice to opt for. It also allows you to sell in multiple places, including web, mobile, social media, and online marketplaces. It is a WordPress Plugin and free to avail. Native support for multiple languages. Support for multiple languages via third-party plugins. File storage depends by your web host. Both allow you to customize the shipping rates and taxes. Both of them has a Mobile-friendly structure. Shopify is much clear in terms of pricing. It depends on the different type of eCommerce Development. However, WooCommerce is free to use, yet it always comes with other expenses. WooCommerce falls under WordPress which needs a proper hosting, domain name SSL certificate and extensions to run a flawless e-store. All of the factors increases the total development cost and thus users are in the dilemma. 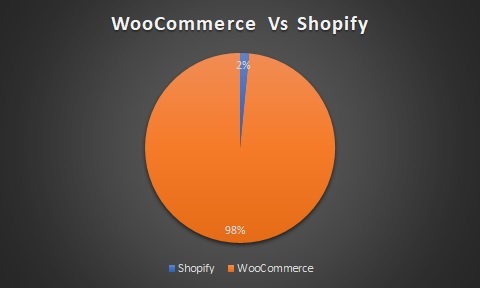 Woocommerce covers 41% of total usage whereas Shopify covers 10%. Shopify is a subscription-based online E-Commerce Development Tool. One just needs to hit Shopify.com and the tool installation options will be right there in the front. Follow the basic steps from a setup wizard. It is quite easy to use, also you can develop highly-navigational and functional e-Store. In case, if you already own a WordPress website, setting up WooCommerce is an easy process. Starting with Woocommerce is not a heavy task, as it offers easy steps to proceed with e-Commerce Web Development. Shopify is a well-renowned platform for its on-time system support. The custom advisers are open to all your queries 24/7. If you get stuck, you can get a quick response and help via email or a chat option. WooCommerce, is one of the widely adapted plugins, which provides excellent support for uses through the forums and WordPress community. You can find the best and relevant answers for almost every questions related to its plugins and usages. Let's start building your online store! As the world is changing shopping experience for each and every domain, walking with the trend is the wisest choice. WooCommerce and Shopify, both are the best ecommerce platforms, now it depends on you and your requirements. In case you are still stuck between these two awesome platforms, reach out the eCommerce Website Development Company based in India, our expert eCommerce Developers will help you and the best possible way. Both of them are viable options for setting up your online store in an efficient way. On top that, both of them are easy to use and feature-rich. Moreover, offers plenty of options when it comes to the visual appearance of your store.